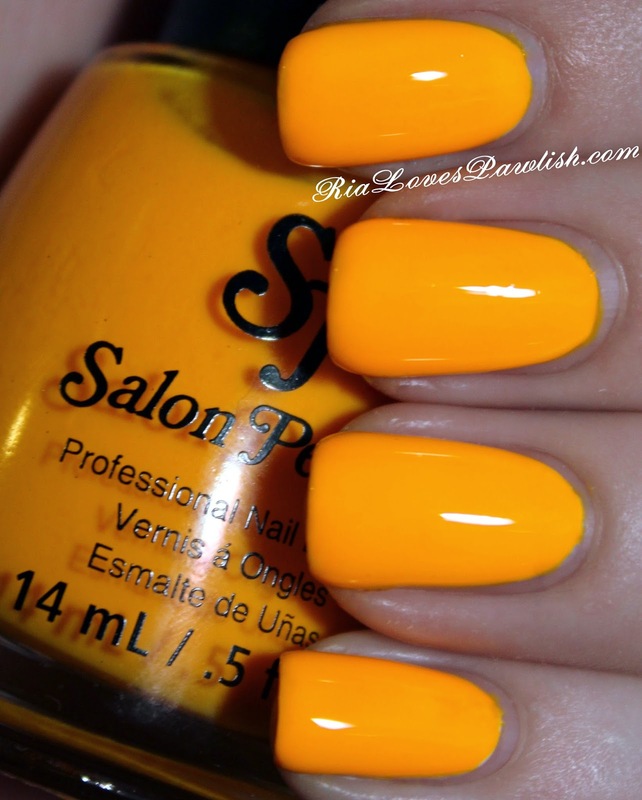 today's Salon Perfect Neon POP polish is Summer Escape! (it's a press sample, kindly provided to me for review). Summer Escape is an orange creme with strong yellow undertones... i couldn't decide when it was on whether is was really orange or actually yellow! Salon Perfect describes it as a 'blazing sunny orange,' and i think that's a great description. the formula on this is a bit tricky, it wants to be patchy. so two coats will get it opaque over a white creme base, but you may need to add polish here and there to touch up thinner spots. this one dries a bit more shiny, rather than the rubbery finish the brighter ones did. it still benefits from a shiny topcoat, though, to really get it looking its best! bonus... it will help even out any lingering patchiness. one coat Salon Perfect Sugar Cube, two coats Summer Escape, one coat Salon Perfect Crystal Clear Top Coat. (all three are press samples).